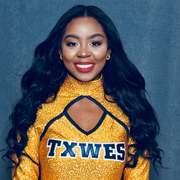 I am a ambitious college student (3.6 GPA) currently attending Texas Wesleyan University. Now in my second semester, I participate in various organization such as: Goldline dance team, President's Ambassador committee, Lambda Tau Zeta, and Student Life Engagement. I have managed to accrue one year of work experience in the position of crew member at Bahama Buck's. Now I have the privilege to teach dance to children of all ages at a studio located in Duncanville. With all the activities I am involved in, I have the opportunity to showcase great leadership, creative problem solving, and multitasking skills. I love children and teaching which reflects in my chosen major: Education. I am very excited to continue to pursue in this field and more excited to see what the future holds!